2013 3rd Quarter Commentary - The Advantages of Asset Class Diversification | Financial Professionals Inc. Note that in 2011 U.S. Long Term Bonds was the best performing asset class and YTD 2013 it is the worst. Historically, spreading your investments over a number of asset classes has been proven to be an effective way to reduce the volatility in a portfolio. Below, we have provided a chart of annual asset class rankings. 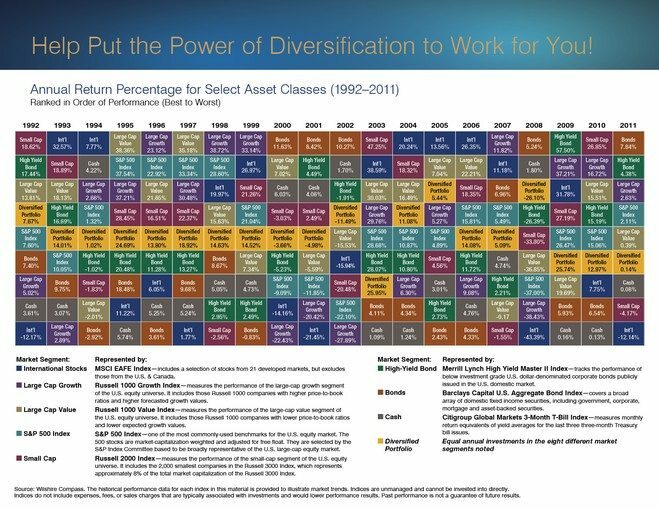 Please note how consistent the Diversified Portfolio rankings have been. We believe a more steady return while avoiding low ranking disasters is a better long term strategy. Especially since trying to pick the top ranking asset class each year has historically proven to be impossible. The views expressed are not necessarily the opinion of Cambridge Investment Research, and should not be construed directly or indirectly, as an offer to buy or sell any securities mentioned herein. Investing is subject to risks including loss of principal invested. No strategy can assure a profit nor protect against loss. Past performance is no guarantee of future results. Indexes are unmanaged and investors are not able to invest directly into any index. Index information was taken from the Vanguard Index Funds on Morningstar reports. This material contains forward looking statements and projections. There are no guarantees that these results will be achieved.